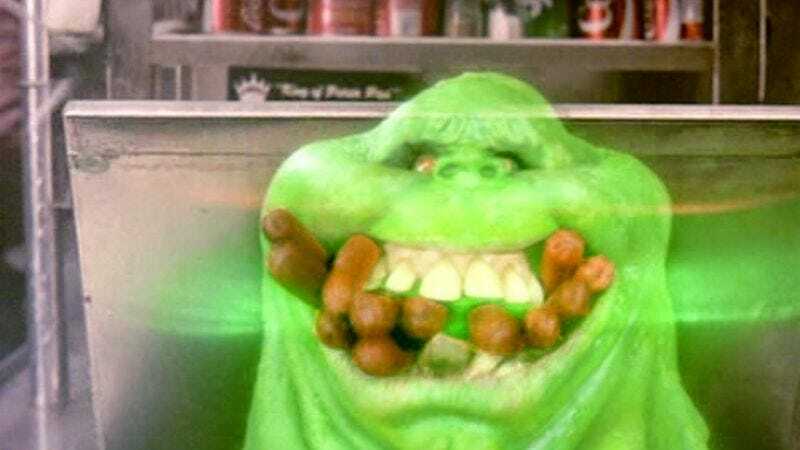 We already know that Dan Aykroyd, Bill Murray, Ernie Hudson, and Sigourney Weaver will make cameo appearances in Paul Feig’s new Ghostbusters movie, but one character we haven’t heard about is the beloved Hi-C mascot known as Slimer (or “Onionhead” if you’re a true Ghostbusters fan). Thankfully, the detectives at Bloody Disgusting decided to answer the question of Slimer’s involvement once and for all by turning to one of the least trustworthy sources of casting rumors on the whole internet: IMDB. Thrillingly, Bloody Disgusting then uncovered the shocking, newsworthy information that not only would Slimer be in Ghostbusters, but he’ll be played by Dan Castellaneta. Shocking! Newsworthy! Paul Feig himself says the story isn’t true, but that doesn’t mean this rumor is totally dead. As it turns out, rumors are stupid and sometimes you never know which ones aren’t true until the movie or TV show in question offers definitive proof one way or another. In this case, Bloody Disgusting is sticking to its guns, updating its original story to say, simply, “Bloody Disgusting can exclusively confirm that Slimer will be in the film.” There’s no source, no other information, and no proof that this is anything but a rumor based on an easy-to-fake IMDB listing, but that’s still not the end of this. If we may put on our Slimer Truther hats, Feig didn’t say that the rumor was false, he only said the IMDB listing wasn’t right. That could easily be interpreted as him saying that Slimer is in the movie, just that he’s not played by Castellaneta. So which is true? Is Slimer in Ghostbusters? We don’t know, be he’s definitely Luke Skywalker in disguise and he’s still alive on The Walking Dead.